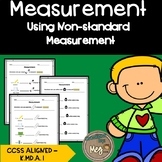 This download includes seven Christmas trees to measure, two different measuring strips (candy cane and ornaments), and a recording sheet. Perfect for a Christmas themed math center! This smartboard can be used as a whole group instruction or during math stations. 2 pages of measurement with paper clips and 2 pages of measurement with blocks. Students use cubes, blocks or whatever you chose to measure the length of the fire hose. They write the number of items it took to measure in the box. 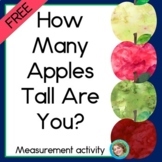 This packet includes activity sheets for measuring common items found in the classroom as well as three color & record worksheets to practice the skill of measuring with non-standard units. 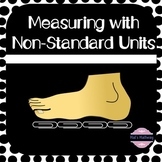 These 3 activities will give your students hands on practice with measuring in Non-Standard units. 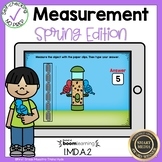 Students will measure various objects using hands, skittles, and paperclips. Measurement With Non-Standard Units: Measure My Ostrich!! 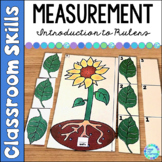 Students will estimate measurement by using their fingers to estimate how many objects will fit under a line and marking that number on a number line. Students will then check to see if the number is closer to 0 or 10 to make an estimate.